Well, you’re hardly going to believe this: although I made it up to a whopping 112 lbs. over Thanksgiving weekend, looks like I’m going to head into tomorrow’s surgery at about 109. Honestly, I’ve done my best to “bulk up” but I think my nervous energy of the past few days has been burning up calories as fast as I can eat ’em. Yesterday, Tim and I went to Harry’s Roadhouse for breakfast and I purposely chose the Lemon Ricotta Pancakes AND the Homemade Turkey Sausage in an effort to put on a final pound or two. However, after breakfast, we bought a truckload of pinon and cedar firewood, and I helped unload it and stack it on the back porch – which was more energetic than I’ve been in months. It felt great to be able to do it, but I probably burned up all the calories from breakfast in the process! I’ve also had a bit of a creative streak unexpectedly hit recently. 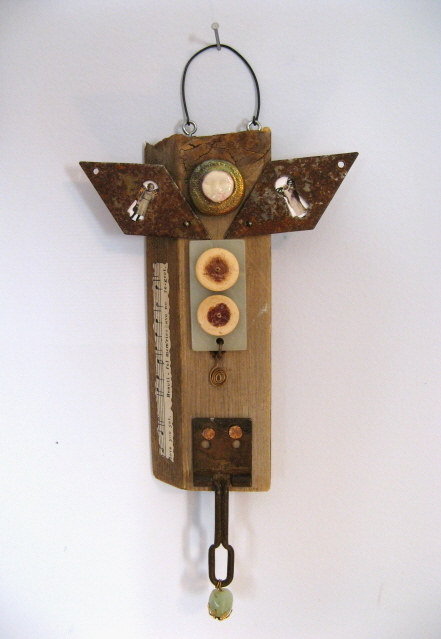 I awoke in the middle of the night a while back with an idea for assembling some old junk (what real artists might call “found objects”) into birds or angels or art dolls – I wasn’t entirely sure what the outcome was supposed to be. I tried to get back to sleep, but finally gave up and went into my little studio/office and began putting bits and pieces together. Over the next few days, I raided Tim’s wood scrap pile, pulled an old box of doorknobs and rusty escutcheons out of the attic, and dug out some vintage watch faces I’d picked up somewhere over the years. 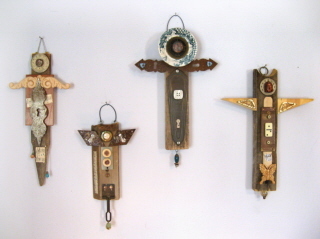 A few beads and buttons, plus scraps of stained sheet music, and these “assemblage angels” began to unfold. I’m delighted with the results, and I think it’s been a wonderful way to channel my nervous energy about the upcoming surgery (even if it meant a little less sleep and more burned calories). I’m reminded by this experience that if you’re willing to listen to some of those crazy middle-of-the-night notions, occasionally you get guided to an unexpected gift. My latest creative effort: a few more angels to watch over me! So far I’ve completed six of these “angels” and I have six more in various stages of the process (with ideas for so many more! )…but it looks like everything is going to have to go on hold for a while now. Today I’ll be running around doing last minute errands in preparation for going into the hospital tomorrow. I’m back on a clear liquid diet today and this afternoon I’ll have to begin taking the “Go Lytely” (what an ironic name for that vile stuff) in order to be completely cleaned out for surgery. My best guess is that after today’s ordeal, I’ll be down to 109 lbs. by tomorrow morning. But the best part of today is that Alison arrives! In addition to being my chief hand-holder for the next week, she’s also agreed to post an update or two following my surgery. I figured you’d want to know how I’m doing, and since I won’t be in any shape to sit at the computer (for quite a while probably), Ali is going to be my “spokeswoman” for a few days. Okay, it’s time to make the most of this day. And thank you everyone, in advance, for all your prayers and healing thoughts as I go into surgery tomorrow (scheduled to start at 12:30 and last for about 3 hours – that’s roughly from 2:30 to 5:30 for all you folks “back East”). I love you all! "love you yet...beautiful memories have no regret"
Wie gehts?,my dear friend. It´s been pretty cloudy today, but I was peeking thru the clouds tonight and I saw a gorgeous full moon,she is full of energy and headed your way. I´m keeping my eyes on her! She will be bringing all my prayers that my faith allows,and all of my heart that my body can give. Get well my friend. YOU are an angel! I absolutely LOVE your new creations. Angels are special to me for obvious reasons. You must reserve one for me (I’m particularly fond of the 3rd from the left) and I will pick it up in person sometime in the Spring. Joe is chomping at the bit for a trip out West and New Mexico is on the preliminary itinerary. YOu won’t see this for a while…but I am thinking of you!!! I LOVE your angels. Thanks for reminding me to follow those nudges. Thanks yet again for sharing so honestly and beautifully. Yay to Allison for keeping the home fires burning and keeping us posted.